The provisional agenda for the Conference can be accessed here. Details on what will be discussed at CMS COP12 can be found on the CMS website, where following COP12 also the final resolutions and decisions will become available. The Caspian Seal, proposed for inclusion in Appendices I and II by the Government of the Islamic Republic of Iran, is the only marine mammal of the Caspian Sea, and is under threat from both commercial exploitation and bycatch in industrial and artisanal fisheries. Combined with a slow reproduction, its population size has significantly declined in recent years. Currently, the Range States of the Caspian Seal do not have real protection measures in place. A CMS Appendix I listing would help protect the species from hunting, poaching and bycatch, and enable artisanal fishers to benefit from the revenue that the species generates from sustainable tourism. Doc.25.1.6/Add.1 contains the supportive comments of the 2nd Meeting of the Sessional Committee of the CMS Scientific Council. The Council noted that the species could benefit from a Concerted Action, due to the conservation status of the species and considering all threats identified. In 1999, the Whale Shark was listed in Appendix II of the Convention after a proposal from the Government of the Philippines, due to the threat of legal and illegal exploitation combined with their longevity, delayed maturity and low fecundity. Now, the Governments of the Philippines, Israel and Sri Lanka jointly submitted a proposal to include the Whale Shark in Appendix I, while maintaining its status under Appendix II. A 2016 reassessment of the species’ conservation status classified the species as globally Endangered on the IUCN Red List. With an Appendix I listing, it is anticipated to lead to increased attention to legislative protection in Range States, and heightened awareness of Whale Shark conservation requirements. Doc.25.1.20/Add.1 contains the supportive comments of the 2nd Meeting of the Sessional Committee of the CMS Scientific Council. The Council notes that the listing proposal is significantly strengthened by the proposal for a Concerted Action (see Doc.26.2.7). The Dusky Shark is a highly migratory species, and catches have been largely unmanaged, resulting in severe declines in population. The threats from targeted fishing and bycatch have led to the Dusky Shark being classified as Vulnerable to Extinction globally on the IUCN Red List. The Government of Honduras submitted the proposal for the Dusky Shark to encourage and support improved collaborative management for this species by Range States, through both CMS and through Regional Fisheries Management Bodies. A more precautionary multilateral approach to the Dusky Shark’s management may help in reversing declines and making fisheries more sustainable. Doc.25.1.21/Add.1 contains the supportive comments of the 2nd Meeting of the Sessional Committee of the CMS Scientific Council. General comments include adding data on landings and stock assessments, as well as noting that defining Concerted Actions would benefit the proposal. The Blue Shark is among the world’s most highly migratory fish species, occurring as transboundary stocks, and distributed in both high seas and within EEZs. Data on this species are still limited, such that it is difficult to conduct a stock assessment and provide management advice. Because of this, little action has been taken to manage and protect this species properly. Blue Sharks are quite vulnerable to fishing pressure, both through targeted fisheries and bycatch. The Government of Samoa, jointly with the Government of Sri Lanka, has proposed this species for listing to encourage governments around the world to conserve the Blue Shark by taking precautionary, regionally coordinated action to ensure that Blue Shark fisheries are sustainable throughout the species’ migratory range. Doc.25.1.22/Add.1 contains the supportive comments of the 2nd Meeting of the Sessional Committee of the CMS Scientific Council, recommending that the proposal would benefit from additional information on the conservation status of the species, as well as from the development of Concerted Actions. The Angelshark is endemic to shelf seas in the North-East and Eastern Central Atlantic, Mediterranean and adjacent seas. Its movements and range are poorly documented, due to the species’ scarcity from depletion caused by target fisheries and bycatch. Public and fisher awareness of the Angelshark’s threatened status and the existence of mitigation measures is generally poor, and Range States’ activities to implement polices aimed at protecting the species and compliance monitoring are often lacking. Hence, the Angelshark would significantly benefit from a CMS Appendix I and II listing as it would stimulate full protection from CMS Parties. Following a listing in the CMS Appendices, the proponent will propose the Angelshark for listing in Annex I to the CMS Sharks MOU and lead work with Range States and other partners to develop a Concerted Action for this species. Doc.25.1.23/Add.1 contains the supportive comments of the 2nd Meeting of the Sessional Committee of the CMS Scientific Council. The Government of Israel submitted two proposals in one, for the inclusion of the global population of the Common Guitarfish in Appendix II, and further proposed the inclusion of the Mediterranean Sea population in Appendix I. The species is considered by IUCN as one of the most endangered fish species in the Mediterranean Sea. It has suffered severe declines and regional extirpation throughout its former range, mainly due to overfishing. Given the extreme population declines that the species has suffered, current population and migration status are difficult to determine. However it is clear that it would greatly benefit from better protection in the Mediterranean Sea, and from better regional and international co-operation to preserve the populations that remain in the Mediterranean Sea and in Western Africa. The proposal may be revised, as more information was requested by the Council in Doc.25.1.24(a)/Add.1 on the migratory behaviour on a species or family level to strengthen the proposal. This information is already included in all three versions of the proposals from Mauritania, Senegal, and Togo. This species was proposed for listing by the Governments of Mauritania (Doc.25.1.24(b)), Senegal (Doc.25.1.24(c)), and Togo (Doc.25.1.24(d)) for inclusion in Appendix II. As the proposals are very similar and were assessed together by the Scientific Council, these may be merged prior to or at the COP. The Common Guitarfish would greatly benefit from better regional and international cooperation to regulate target and bycatch fisheries, halt population declines, and ensure the recovery of Mediterranean, Southern European and Western African stocks. Doc.25.1.24(b-d)/Add.1 contains the supportive comments of the 2nd Meeting of the Sessional Committee of the CMS Scientific Council. The Council notes that the proposal would benefit from defining Concerted Actions. The White-spotted Wedgefish was proposed by the Government of the Philippines for inclusion in Appendix II. This species is especially vulnerable because of its use of coastal habitats, susceptibility to multiple gear types, large size, and value in trade. The White-spotted Wedgefish is classified by the IUCN Red List as Vulnerable globally due to local population depletions driven by overfishing in artisanal and commercial fisheries, targeted primarily for their fins. Given these threats, a listing on Appendix II of CMS would provide additional support for introducing collaborative management of this species by Range States, through CMS itself and through possible inclusion of on the Sharks MOU. Doc.25.1.25/Add.1 contains the supportive comments of the 2nd Meeting of the Sessional Committee of the CMS Scientific Council. The Council recommends the addition of information on the migration behaviour of the species or alternatively the wider taxonomic group to the proposal, as well as defining Concerted Actions with a focus on improving data collection. The European Eel was listed in Appendix II of the Convention at COP11 in 2014 due to the significant concern of the status of the species from a decline in recruitment, population, and escapement. A workshop was held in 2016 to bring European Eel Range States together, focusing on knowledge gaps and conservation needs, and a second meeting was recommended. The Government of the Principality of Monaco, in collaboration with the Sargasso Sea Commission and the CMS Secretariat, submitted a proposal for a Concerted Action to convene a 2nd meeting of Range States to discuss a potential CMS Instrument for the European Eel, which would provide an important template for the management of other anguillids. Other activities in the proposal include filling data gaps in conservation and management, and improving data flow and collection. Doc.26.2.1/Add.1 contains the supportive comments of the 2nd Meeting of the Sessional Committee of the CMS Scientific Council. Sperm Whales are a highly migratory marine species, listed on Appendix I and II of CMS in 2002, and have been included on the CMS concerted action list since listing. This proposal for Concerted Action, submitted by the Expert Working Group on Culture and Social Complexity, is focused specifically on four clans of Sperm Whales which have been identified in the eastern tropical Pacific (etP). Decades of research has revealed a complex social structure within the etP Sperm Whales. these clans show little or no differences in their nuclear DNA and the primary differences between them are socially learned and therefore, cultural. It is proposed that a concerted action is undertaking for etP Sperm Whales based on their culture, with the objective to create a collaboration across Range States for data gathering. Key elements of this collaboration include photo identification, acoustic monitoring, and the collection of behavioural data and faecal samples to elucidate social structure and differences in foraging success between clans. This information can help determine how these clans should be conserved according to different responses to environmental pressures. Doc.26.2.2/Add.1 contains the supportive comments of the 2nd Meeting of the Sessional Committee of the CMS Scientific Council. It was noted that the proposed action implements part of the recommendations made in Resolution 11.23 on Cetacean Culture. The Atlantic Humpback Dolphin was put on Appendix II in 1991, and was then listed in Appendix I in 2009. The species is included under the Western African Aquatic Mammals MOU concluded under CMS in 2008, and covered by the associated Small Cetacean Action Plan. However, since the signing of the MOU no range state meetings have taken place. This proposal for Concerted Action was submitted by the Appointed Councillor for Aquatic Mammals, together with two NGOs: Conservation and Research of West African Aquatic Mammals (COREWAM) and Whale and Dolphin Conservation (WDC). This concerted action would allow more short-term action involving the Range States of this species. It proposes to form a Steering Committee among stakeholders of Range States, to prepare for a Conservation Policy Meeting of Range States in 2018. This meeting’s purpose is to define an Action Plan for renewed efforts to halt the decline of the Atlantic Humpback Dolphin. Doc.26.2.3/Add.1 contains the supportive comments of the 2nd Meeting of the Sessional Committee of the CMS Scientific Council. The Council notes that there is a need for a review of national legislation throughout the range to identify gaps and opportunities relating to the conservation of the species. The Humpback Whale was designated for Concerted Action in 2002. The Arabian Sea Humpback Whale (ASHW) was highlighted for special attention, given that its conservation status is markedly different from the species as a whole. Specific actions within the existing Concerted Action are therefore proposed at the population level by the Appointed Councillor for Aquatic Mammals. Estimates of ASHW suggest that fewer than 100 individuals remain in Oman’s coastal waters, but no estimates are available from other parts of the population’s known and suspected range. Genetic data indicate that the total effective population size is likely to be less than 250 individuals. Threats to whales in the region include accidental entanglement in fishing gear, ship strike and disturbance from underwater noise created by the shipping and transport industries, as well as coastal and offshore construction, seismic exploration and offshore oil and gas production. An ASHW Concerted Action can improve conservation status for a wider range of marine taxa throughout the region by acting as a flagship species, and the encouragement of new Party accessions. The proposed Concerted Action has a list of activities which over an initial three-year period would result in an enhanced understanding of the ASHW population and its conservation needs and the development of a regional conservation and management plan with support and participation from Range States. These actions fall under three main categories: 1) addressing knowledge gaps; 2) information sharing and awareness; and 3) capacity building and development and implementation of mitigation strategies. Doc.26.2.4/Add.1 contains the supportive comments of the 2nd Meeting of the Sessional Committee of the CMS Scientific Council. This proposal was submitted by the Government of Monaco alongside the proposal for inclusion in Appendices I and II of the Convention. International organizational and management structures for the mitigation of threats are vital to improve the conservation status of the Angelshark. The potential threats faced by Angelshark populations vary according to geographical area, highlighting the need for specific regional actions. The activities in the proposal include implementing aspects of the Eastern Atlantic and Mediterranean Angel Shark Conservation Strategy (Inf.22) and the Angel shark Action Plan for the Canary Islands (Inf.17), aiming to restore the populations of Angelsharks by minimizing mortality and human impacts and improve data on critical sites. The activities proposed are intended to serve as a catalyst to deliver effective conservation for Angelsharks, but also to serve as an opportunity for Parties to collaborate for the protection of other marine species. Doc.26.2.5/Add.1 contains the supportive comments of the 2nd Meeting of the Sessional Committee of the CMS Scientific Council. The Manta Trust, together with the Wildlife Conservation Society, have proposed to include the entire family of mobulid rays (Mobulidae) on the list of species for Concerted Action. All species of mobulid rays (Manta spp. ; Mobula spp.) are also listed in CMS Appendix I and II since 2014. A comprehensive approach and strategic plan is crucial to ensure the long-term conservation and sustainable use of mobulid rays, along with effective implementation of CMS and CITES requirements, and of effective national legislation. Empowering coastal communities and ensuring long term support for transition away from a dependence on unsustainable fishing practices and new income sources suitable for their context is needed. This will help safeguard the sustainable development and economic future of communities most impacted by protection measures who often have the least ability to absorb major regulatory changes. The activities in the proposal request in part for the implementation of the Conservation Strategy for Devil and Manta Rays (Lawson et al. 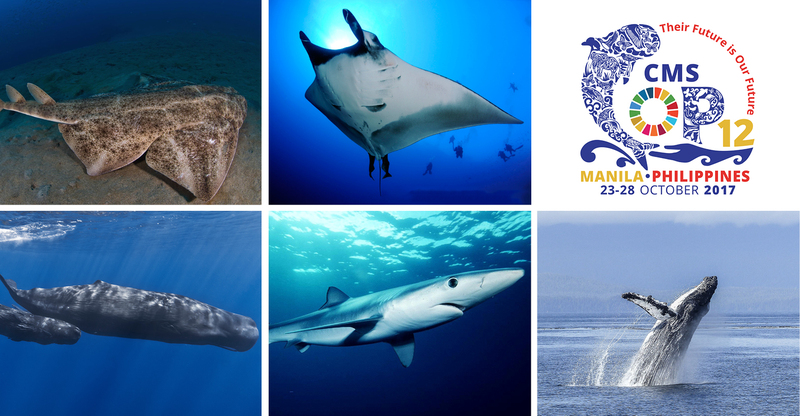 2017; Inf.18), with a vision that populations of devil and manta rays should flourish in resilient ocean ecosystems, harmoniously with human communities, through knowledge, sustainability, and education. Doc.26.2.6/Add.1 contains the supportive comments of the 2nd Meeting of the Sessional Committee of the CMS Scientific Council.The Council requested clarification on the exact scale and scope of the proposed actions, particularly defining which countries would be involved, as well as information on responsibilities and funding. In addition to their proposal to include the Whale Shark in Appendix I of the Convention, the Government of the Philippines has proposed to include the species on the list of species for Concerted Action. The species would benefit from improved management and conservation efforts across its boundaries. The proposed activities include the hosting of workshops with neighbouring countries to further research and conservation of the species, to improve understanding of Whale Shark ecology, connectivity and threats, to create unified basic tourism guidelines, and to improve reporting and the understanding of threats to Whale Sharks (e.g. net entanglements, vessel collisions etc.). Ecotourism, like tourism in general is one of the fastest growing economic sectors in the world. Tourism centred on Whale Sharks, undertaken in a sustainable way, would significantly support local communities in remote areas and would create alternative livelihoods. Doc.26.2.7/Add.1 contains the supportive comments of the 2nd Meeting of the Sessional Committee of the CMS Scientific Council. It was noted that the proposal would benefit from additional information on the scope of the activities, the required funding and the entities responsible for the implementation. The government of the Philippines was therefore recommended to submit a revised version.